The conservatory has been a whirlwind of learning, experience, challenges, and many personal breakthroughs. What more could one ask for? I had expected to feel growth within myself, but I feel like I am walking away with more than I expected, and that is a powerful feeling. I am most proud of the project I have been creating over the course of the conservatory with the guidance and direction of Kari and the outside eyes of others involved in the conservatory. This project is an abstract exploration of Blanche Dubois throughout the play A Streetcar Named Desire. Not only have I learned an incredible amount about Blanche through character exploration, but I have been challenging myself on a personal level as an actor and artist. I have always had an interest in Blanche, and I was working on one of her monologues with Kari over the winter through the Margolis Method Online Training. Before the conservatory started, Kari and I had talked about working on more of her monologues, and we then decided that it would be amazing to create my solo project around this idea. Instead of performing monologues, I went through the play and picked out important lines from throughout; some in bigger chunks, some were a line from here and there, and pieced them together into sections that were not necessarily linear but themed well together. The concept of the project is to have the audience experience what it would be to have Blanche alone in her bedroom, and live through many of the events and her emotional states of being through the play. Blanche is an incredibly complex character, but she is human, and we are all complex beings living through life. We are never living in one pure emotional state, and we all have life experiences that make us who we are today. Life experiences are both good and bad, and shades of beautiful and ugly. My goal is for the audience to go on an emotional journey with me through the lens of Blanche. A comment I had made to Kari after our first run through of my piece was, “I have always struggled memorizing text, and I am so surprised that I ran the entire piece without having to think about what the text was! I wasn’t worried about where I was or what was coming next!” Her response was that it is because I muscularly manifested it the way we broke down each section and each transition so specifically. One of Kari’s BIG quotes is “Specificity elicits creativity!” This is so important. From minute interactions with objects to the larger transitions of scenes, every detail counts. The more specific you are, the more crisp, clean, engaging, and inspiring it is for yourself, and for the audience. It has been an honor to work with Kari in this creative way. She is brilliant at what she does and is so passionate to help others to challenge themselves to reach their best and beyond. I have learned so much from every exercise, every improv, and every moment of this conservatory! I will be leaving smarter, stronger, inspired, and even more passionate for the method, to create more work, and apply my skills to future projects! I have difficulty keeping the history of a character. I lose it. I rely on the fact that the audience has seen what I’ve just gone through and I move on to the new event of the story. But, this week, through practice, I learned that expressing a transition in the life of the character CAN’T only be expressed visually; even if the transition is well justified within the structure of the play. For the audience to understand it and be able to follow the journey of the character, they must be able to anticipate it and feel it, it’s not enough for them to just see it. I learned that I wasn’t making enough time for the audience to anticipate the transition nor to keep the transition alive. In other words, I was ending the beginning packet as if it were the ending packet or the ending of the story. It was jarring to the audience because they felt that the middle packet was the beginning of a new story instead of the continuation of the first packet. So, what does it mean to create more time? I learned that I have to start the last beat of the first packet with enough momentum to not only suspend the last action throughout its entire duration, but also to suspend the new conditions (brought by the last action) throughout the duration of the transition. The transition might be very long or very short, but I must suspend the time if I want the audience to understand that I’m expanding on the journey I’ve already begun. The audience thought my transitions were jarring because I had only created enough time to keep the last beat alive but not the transition. So, first, they witnessed the journey of a character lose her power, then the actor stopping in a neutral state and finally the journey of a character who started from a wobbly place gain stability. I’m happy I had this moment of discovery because it is often in the transitions where actors lose the attention of the audience. I must remember to sow all the acting beats together if I want to invite the audience in o my journey." Today was the first day I put my creative process on its feet. I used a doll and a wine glass as props, a table and chair as set pieces, and I put on what we decided is going to be my character dress. As text, I picked a song to start my improvisation. Kari sat in front of me. I start improvising with all the elements. I feel I’m being very general. I’m walking around the space with no specific purpose, holding the doll in my arms like a baby and singing the song to it. I’m not making clear events nor packets. I wasn’t sure what should be my primary focus, the object? The song? The space? Kari’s first advice: “make it simpler. Sit down and don’t worry about the space. Now that you are sitting and the doll is on your lap, ask yourself: How can you handle the doll? Where can it go from here? And let’s just focus on the first three lines of your song”. And so I did. I took the doll by the arms and starting dancing with it. We liked the idea so we decided to use it for the first sentence. I kept on finding different ways of singing to and interacting with the doll and beat by beat we kept justifying with the text. At this point, I had three sentences of text with two actions using the device “actor to object” (we didn’t put any limitations on the devices I was able to choose from). Kari asked me to repeat it a couple of times and I was, little by little, starting to feel more confident as I was starting to become more specific. Nevertheless, after the second repetition came the questions: “What are you trying to inspire? Can you be more specific about how you feel about the doll and the song?” I explained that my character was being completely sarcastic dancing with a doll in on her lap, singing “My Baby Just Cares for Me”, and with a wine glass standing on a table right next to her”. There was a moment of silence. A red flag came up in my head! How do I make my sarcasm clear? I chose to repeat it once more focusing on my demeanor. If every technicality I was focusing on were a ball I was trying to juggle, I had dropped the “demeanor ball”. When I picked it back up, my objective became clear. The red flag in my head went down. The rest of the session worked very similarly. I kept crafting each moment building it from the previous one and always asking myself: with the given history and conditions, which options do I have to move onto the next moment? Also, more juggling balls were added (like: how do I incorporate the wine glass?) and other balls were dropped (like identifying which devices I was using at every moment). I was very nervous to put my project on its feet. I thought it was going to be a more complex task and it turned out to be simple. Yet, simple should now be confused with easy! The level of specificity I realized I needed to inspire an honest reaction in the audience, was difficult to achieve, but it’s not complex. The biggest lesson I learned: To inspire the audience takes time, not complex ideas. Lastly, a question that Kari asked me while I was improvising that stuck with me is: “Where do you feel you’re inspiring a lighting change? Or a music change?” Having these questions in mind help me craft my events and I found it a very poetic/theatrical way of thinking about events. I’m excited to continue the journey. "My first week of conservatory training is a continuation of 6 previous weeks of training including Professor Certification and the Student Session. One aspect that makes the conservatory unique and enjoyable is the extra detailed attention given to each actor's individual growth due in part to the smaller size of the cohort. We are also already building creative work which really helps put the method into practical application. As an artist and educator, I feel that the conservatory has already given me a deeper focus to practice both my creative self and my teaching self. On Friday, I led four different actor prep exercises. It was exhilarating to stand in front of my colleagues to “practice” my teaching skills and receive supportive feedback. This individual training time towards certification will allow me to really receive feedback that is microscopically specific to my growth and eliminate any actor tendencies so that I can more precisely teach the method with confidence and demonstrate for my students the full manifestation of all Margolis principles. It is rewarding to know that I can really practice these exercises and really be true to refining the specificity of my pedagogy. I have experienced other types of peer-reviews of my teaching but most respondents do not have a vocabulary in which to really be specific as with the vocabulary Margolis Method offers. Another unique aspect of the Conservatory is the creative work that we have started to develop out of improvisational structures. For example, Kari proposed a limitation of working on a bed with the idea of it representing “boundaries.” Both Eli and Jackie had a chance to explore this a day before me so I was excited to hop-on since I really didn't have any real sense of what was to be expected. The freedom to explore within a specific limitation may sound like a contradiction but in fact setting up a structure allows me to explore with focus. While I explored physically on the bed, my colleagues, Eli and Jackie, improvised speaking text. Kari would pause us when we made discoveries or at times when we seemed to lose intention. This stop and go format was different for me. I am more accustomed to improvising for long a period of time and then reflecting back on what was experienced. I am finding value in the process as I can see the pedagogical value of pointing out to students when a choice is vague or unintentional versus letting them roll through lots of ideas without any purpose. I feel that after this instruction via stop/go format, we will all be more capable of improvising with deeper intentions and connections to our scene partners. It is very exciting that we have already started these group improvisations as well as our individual projects which we will perform at the end of the conservatory. I anticipate lots more hard work and play! It is truly a gift to spend such concentrated time on training." "This week we have been doing a lot of different improvisational exercises, and I keep reminding myself the same phrase, “Stop second guessing your impulse!” I am afraid of not making the right choice, not making a choice that is strong, where can my choice take me next, but the biggest problem with this is…. I am not making a choice! Through all of these improv exercises I am learning to be more confident within my skillsets. I have all the right tools, and all the right ideas to make a strong choice, I just need to make one, commit to it, and work from there. Once I make a choice to do or say something, then I can recognize and refine it to make it the most specific idea possible. But I need to do something to go somewhere! I am the only one holding myself back with all of this second guessing hesitation. During our class on Friday, I really enjoyed how we did a few different actor preps, improvised with these tools, and then learned how to apply them to create something. At the end of the class we had created a couple of different scenes for projects we will be working on throughout the conservatory. First, we worked with a specific exercise and device using breath and traveling. We did some solo research and then came together to work as a group to focus on our skillsets in ensemble and unisemble work. Through this we were exploring the relationship of our characters and with the use of space. We then worked on a different exercise with the device of pendulums on the floor, and applied it to our bed improvisation. This brought our bed project to a whole new level, and it was great to see how being specific with the skills we have can push us to new creative heights. I learned through this exploration that once you have made a choice, to give it meaning, go deeper and explore what is happening and how it affects you. Everything else follows after that including momentum and demeanor. It is truly exciting to see how each of us are growing as we dig deeper into the method. All of this is helping me both in class and with creating my solo project. The best place to start is to try something. If it isn’t working, try something else, if it is working, refine it, and make it as specific as possible!" Digging Deep - Conservatory Blog Day ONE! Summer Session has drawn to a close, and the next nine weeks are devoted to a more rigorous, focused Conservatory Program. As part of their experience, participating artists will be blogging each week to share their thoughts, challenges, reflections, and breakthroughs. Today was the first day of the 12-week Conservatory where only the Conservatory artists are here for 9 more weeks. After training in the Summer Sessions and talking about all of our goals as a group, our personal goals and the array of projects during the conservatory, I could not wait to dive in. I honestly wasn’t sure what to expect with the size of the group being much smaller and having more individual attention and focus. How would the flow of the class go? What would the energy of the room be like? How will we be pushed to new levels? But now that the first day has come and gone, I look on it and I am just so incredibly happy to be here! The day started with a beautiful Monday morning physical workout, waking up those muscles (not bones) and getting our bodies, minds, and energy ready for what Kari would have up her sleeve. Training our actor warrior bodies in all the best ways! We had our actor prep, which lead to our first focus, which resulted in me being brought up in front of the class to identify and work through many of my personal tendencies and habits. We honed in on how I work a lot with my arms and focusing on how to lower where I am strong. I have a lot of tension that I hold in my neck and back that we are going to work through. It will take some time to get those muscles to relax and my posture and alignment to straighten out, but it will be worth all of the hard work. It was a struggle to focus on these specific muscles for an extended period of time, but the more I work them, it will feel natural. Then we worked on pendulums as a group and gave each other feedback after each person lead a series of five packets. Lastly, we ended with the exploration of improvising with a set piece of a bed. Here is the twist of the improv, the person on the bed would choose different devices to service their character, which would inspire the others to speak text, or the text the others spoke would inspire the actor on the bed to make choices. It is very interesting that we are working with text from one of Trump’s speeches and exploring how the “boundaries” “fear” and “reality” which he speaks about can be translated to the worlds we create with the bed. The person on the bed would create the size of the world, and what the world may be in their scene. A few examples would be: feeling like the bed is a tiny confined prison that you want to get out of or feel trapped in, is it a ship in a big open ocean, is it a flying carpet bringing you through a journey of your fantasies, and so on. On the bed there were sheets and a pillow and those also had their own metaphorical meanings depending on where you were going in the scene. Was the pillow a shield, were the sheets suffocating you or on the contrary were they protecting you, did the pillow become a symbol of comfort, etc. These are all just a few examples of what could be possible, but there were so many more options to be explored. Thinking metaphorically is a skill set on its own that needs to be practiced and this is an incredible exercise to stretch our poetic minds. I have found that I find it much easier working as the character on the bed than being the actor in the chair speaking the text. There are many balls to juggle all around in this exercise, which makes it great to push our skill sets to new levels. At first I was very nervous, but I took those nerves and volunteered to go first. I have to say I was surprised and pleased with the result of what we brought to the table for it being the first time doing the improvisation. After our training in the morning, we worked on our solo projects in the afternoon. This is my first time devising a piece on my own and i’m excited to begin the process. I am only at the very beginning stages of the process, but have a lot of inspiring ideas that I will be exploring with the subject I have chosen. For my piece I am exploring different behaviors and text of Blanche from “A Streetcar Named Desire.” For a long time I have been highly interested in this play and learning about Blanche with all of her complexities. I can’t wait to see where my research takes me! Biggest lesson learned after the first day of the conservatory: IT’S ALL ABOUT INSPIRING. I walked into the studio at 9:30am and the space was already inspiring (which really helped calming my first-day nerves down). There was a bed in the right corner of the studio and two car seats by the door facing the center of the studio. We started the session at 10am with a workout that involved weights and planking for what felt like an hour (1st personal goal: it must feel like two minutes by the end of the conservatory). There was no mentioning of the bed nor the car seats. Kari kept reminding us during the workout to not conform our energy into the weights but to feel the resistance our muscles were offering against it. Already we were creating dramatic conflict with just work out exercises (brilliant!). After working out our entire bodies and feeling our muscles conflicted by resisting to getting sore (2nd personal goal: not feeling sore by the end of the conservatory) we moved on to focusing on technique. There still was no mentioning of the bed nor the car seats. We started with a series of exercises that focused on the core inspiring a gesture in a particular plane. As we had worked through the exercise for what felt shorter than the time we spent planking, Kari finally referred to the car seats and asked us to sit down on them. We watched Jackie work the same exercise in detail as we gave her feedback. It was very enlightening to go into such specific detail and seeing the changes in the actor. Furthermore, the seats were super comfy. Next, we continued working on pendulums. First we focused on getting the technique of it and then we moved on to a more advanced exercise where we created a triangle and one actor had the job to inspire the rest to follow his/her actions. As nervous as I was to start this exercise (and because the bed hadn’t been acknowledged yet), it also turned out to be very enlightening. It brought up the question: how do I inspire the other actors while keeping the technique and while planting the seeds to make clear packets? Because we were a small group of actors, we had time to explore it and discuss it. What stuck with me the most, since my biggest challenge during the exercise was to inspire, is that I can play with weight, force, and gravity to bring specificity into the manifestation of my packets, specially if I’m inspiring from my back without being able to use my facial expressions nor text. (3rd personal goal: ground my pendulums and find dynamics in them to inspire the audience by the end of the conservatory). 1. The actor on the bed doesn’t speak. He/she must inspire or be inspired by the text. 2. Any devices can be used. I felt the complete opposite of empowered when my turn arrived. With so many conditions in mind, I felt like I’d be very general. Yet, once I found myself in the improvisation, I found that sticking to the limitations and making strong choices about the space around me was enough the be inspiring. In my case, my first impulse was to examine the sheets and it inspired the other actors to speak the most poignant words in Trump’s speech which were “they will attack you, they will slander you”. Suddenly, the sheets had meaning and my action was justified. From then, we had the beginning of a story: a character who wanted to get rid of the sheets in her bed as she didn’t feel protected by them anymore. Her safe place or her reality was being challenged by her fears . My experience improvising turned out to be, once again, enlightening. Of course, now I have to work hard towards more specificity (4th personal goal: create one event at the time and stay with it until the character solves it or changes conditions) but I felt completely supported by the limitations and the text spoken by the other actors. I thought that finding poetic meaning would be more difficult to accomplish but I was surprised to see that by building a story beat by beat it just happens naturally. When creating an inspiring world, I was used to first create it in my mind and then find the devices that would help me make it come to life, but this was a more efficient way of creating. I’m excited to keep exploring! I’m very happy to be part of the conservatory. Being such a small group of actors, besides feeling terrifying sometimes because there is no way of hiding, provides the opportunity to dig into our habits, the technique of one or multiple devices, and improvise creative projects all in one session of training. Moreover, the fact that it’s a 9-week program provides me with extra motivation to practice as it seems like enough time to achieve, hopefully, all of my goals by the end of it. I can’t wait for the adventure to continue in both, the training sessions and the rehearsals of my personal project. It’s a good bet that each and every one of us has had the experience of being on stage and not feeling the magic -- and we all know just how bad that feels. Being a great actor certainly can’t rely on luck, and knowing how to manifest emotions each and every time we are on stage is essential to our craft, and fundamental to all Margolis Method exercises and improvisations. The Creative State is when the actor’s muscular, intellectual and emotional aspects are all in balance. Finding this balance takes conscious effort and practice as all actors tend to lean toward one side of what we call the intellectual / visceral scale. Intellectual actors can determine every aspect of their character’s history and back story and can break down a monologue into all its beats, but have a hard time actually manifesting this information into a performative moment. Visceral actors, on the other hand, can cry on a dime and find emoting easy, but can’t remember their text or repeat the same moment twice. Each of our natural abilities will most certainly serve us, but they will limit us as well if we rely exclusively on them. Practicing the balance of the Creative State allows us to own our craft and assure for a deep, honest connection to our character’s emotions each and every performance. You can also remember the Creative State as PIE, which was coined by Artistic Associate Kym Longhi as short for Physical, Intellectual and Emotional. Thanks Kym! Find video discussions on concepts like the Creative State along with creative exercises, dramatic improvisation structures, actor warm-ups, and much more with Margolis Method Online. Join the Online Actor Training Revolution! "You have to be somewhere to go somewhere." Inter-Spatial: Forward, Back, Left and Right in reference to a fixed downstage. Inner-Corporal: The actors orientation in space in relation to the direction of the pelvis. 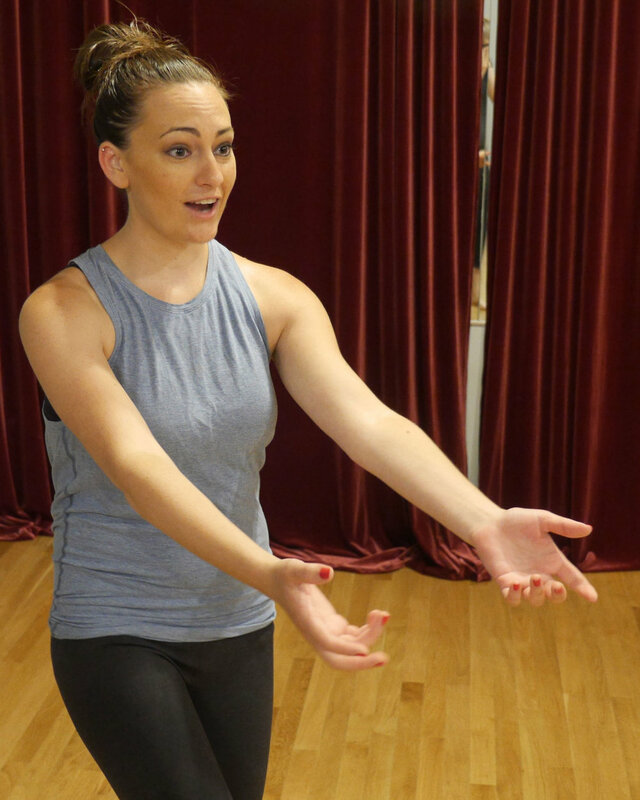 Inter-Spatial and Inner-Corporal Cardinal Directions help the actor develop a deeper sense of where they are in the space, and their connection to the audience. By understanding and being able to track the relationship between Inter-Spatial and Inner-Corporal Cardinal Directions, the actor can more easily feel pattern, memorize complex stage choreography, and derive further creative inspiration by feeling the poetic story being told thru the device of direction changes. Find video discussions on concepts like Cardinal Directions, along with creative exercises, dramatic improvisation structures, actor warm-ups, and much more with Margolis Method Online. Join the Online Actor Training Revolution! Fundamentals of Storytelling: Beginning, Middle, and End. The smallest grouping of ideas that introduce, explore and resolve a dramatic conflict or situation. Beginnings, Middles and Ends, it’s hard to imagine any story without them! Yet it is amazing how often the grammatical shaping of our ideas is lacking, and our story telling becomes a series of run-on thoughts and actions. Understanding, identifying, and practicing the creation of Dramatic Packets is an invaluable actor skill set that will assure every monologue, scene, and production will be vibrant, alive and meaningful. Find video discussions on concepts like Dramatic Packets along with creative exercises, dramatic improvisation structures, actor warm-ups, and much more with Margolis Method Online. Join the Online Actor Training Revolution! Day 6 of our 10 day workshop was when we first encountered an exercise in which we were able to use text as a narration of our stories. Although it was tempting to tell the audience everything, this exercise helped me to find specificity and purpose for everything I did and said. Although these are all important concepts that we have addressed with Kari, I would like to talk about the characters we created. In today’s exercise, our characters were confined to a small piece of our space in a round shape. Our job was to create a story with a packet (beat, etc) of three that gave us insight to their struggle inside this space. Finally, we were to create a final fourth beat that gave the character hope. Kari discussed the importance of metaphor with a character. A character too stuck in the literal is only going to resinate with a certain number of audience members. But the character that is a metaphor, a character that represents hope, being confined by their surroundings, etc, can and will resinate with a larger audience. She challenged us to find what aspect of humanity our characters represent (in any acting piece we do, in any moment that they live). This had a huge impact on me. I can’t wait to bring this to not only my acting, but also my comedy writing. This is my favorite concept of the Margolis Method, and in many ways the overarching purpose of what the Method means to me. Boiled down to the simplest terms, this short phrase reminds us to take all of the guesswork out of acting. Although it may make logical sense to believe that the broader the acting choice the broader the array of audience members it can affect, this week has really made me take the time to stop and consider how much the opposite is true. While I always aim to specify each choice, I have further realized how simple it is to make an ambiguous choice and how often actors neglect to specify each action using his or her entire bodymind. Personally, I struggle to manifest each choice in my body. While I am confident in my ability to make clear intellectual choices, these choices often lose their specificity when I am unsure of how to successfully physicalize them. Clearly connecting mind+body+emotion+movement+text by way of the Margolis technique provides me with a tangible way of acting that I can continue to develop and practice. Choices can only become clearer. As actors in America, we have a tendency to seperate our mind from our body. Having such ideas be seperated can cause a lot of damage. Letting the mind and body be their own seperate entity can cause the audience to be confused. For example: The actor wants to send their energy down, but the body is sending energy out instead. The mind and the body aren’t connecting to one another. The mind is doing one thing while the body is doing another. In order to be a true story tellers, we need to practice connecting our bodymind. On the vertical: Up. Down. After only one week of being immersed in the Margolis Method with Kari, I have learned more acting techniques and devices than I can count. I never knew just how many facets of the “acting diamond” there were. Learning about usage of the core, emotional vulnerability, the pendulum, and some of the other concepts we have discussed in class were some that I had heard about before and more or less understood, intellectually. Actually EMBODYING them, though, especially all at the same time, was difficult to say the least. But once I started getting a couple of them down, I had a kind of “aha” moment. Why had I never thought about this or done this before? I felt so connected to body and my actions, and it seems like that should have been happening every other time before, but it did not until I brought my full attention to it. With each new lesson, I feel more and more prepared to take my new knowledge outside of the classroom and I am excited to put these devices to work in a show. I can tell that the countless stomach crunches and leg lifts (down to go up, of course) are seriously strengthening my core. Ever since walking on my feet wrong when I was little, I have always been somewhat unbalanced, but increasing my core strength has helped me center myself and I find myself having less troubles. Then, in terms of art, focusing the energy in my core and allowing it to flow and INSPIRE my movement reduced mindless gestures, which I have also struggled with. I thought gesturing for every thought meant manifestation, but unless the energy of the core inspired it, the gestures were dishonest. Thinking back to shows I have seen, I remember that the most touching and memorable moments were not those where a character displays great strength, but those where a character was vulnerable, going through great change in the story because of it. I did not know how the character would handle the changes that needed to occur, and from the eyes of an audience member, it seemed like they as the character did not know either. That was what made it so exciting. So when we learned in class how to catch the energy and really ALLOW it to take us places, a sort of other-worldly feeling really overtook me. An example was the head-chest-waist-pelvis exercise. I knew that the energy was going to move downward through my body, but HOW it was going to arrive at its destination could change depending on how it fell. I was steering, but my energy was the foot on the gas, and it felt surreal. The pendulum concept is one of many parts to the equation of creating vulnerability. How strong an acting beat is and how long it lasts is within my control. The effect is INvoluntary, but I can set up circumstances that can possibly create the outcome that I desire. For example, if I create an acting beat that inspires little movement, like flicking the pendulum, there will most likely be little change. But, if I inspire great change in an acting beat, like shoving the pendulum, the momentum will create drastic movement. The chair exercise was the perfect example of this. I should not have been focused on how I intended to say my number (my acting beat) but instead on how I could inspire change among the other characters/actors. What effect would yelling create versus whispering, or a quick start compared to an elongated start? We as actors do not want to give an audience everything they expect, but if we do not follow the momentum of the acting beats, we lose the audience entirely. This was one of the most helpful and important lessons for me to learn, personally. Milikin Student Blog Post: Neutral is Not "Zero"
On the first day of class, Kari talked about the concept of a character being in a ‘neutral’ state. We talked about how each beat must inspire the next beat. I think it took me until the most recent day of our workshop - day 5 - to realize what this meant. In each of my acting beats, phrases, and moments, I was returning to zero. I failed to see how each could inspire the other. Even at the end of a packet of moments, the next packet needs to inspire the next. On Friday (our Day 5) Kari said that a neutral body or transition moment is when the character is not at zero. This “neutral” idea is where the character is in a neutral state, ready to move to the next moment. This does not move them to a state of nothingness. They must keep their past alive, as well as inspire the next moment. Essentially, they must always be alive. “Waiting for the next moment” is bringing the character to zero, like waiting for your character’s cue line or the moment in which you move, not keeping the moment alive. In the individual work we did on Day 5, it was clear to me that my characters all returned to zero and were not inspiring the next moment in a packet, phrase, beat, what have you. Milikin Blog Student Post: "Physical Change"
Milikin Student Blog Post: "Down to Go Up"
This January, Kari taught an intensive two week residency at Milikin University. Kari has taught there several years and has developed a strong relationship with many of the amazing young artists she has had the pleasure of working with. We are happy to know they can continue to work all year with the brilliant Denise Myers, a professor at Milikin, who is a Level III Certifying Margolis Method Professor. This year, the students put together a blog as a tool to track their thoughts and growth as individuals as well as a group. Over the next few months, we'll be cross posting their writing here. The sharing of thoughts, ideas, and personal processing can truly help training sink in, and these students have set a phenomenal example of how to approach one's personal growth. Up until this past week, I had been exposed to the idea of dividing the actor’s energy in two directions, and I could physically see on another actor how it created a better scene, but I had not yet made the connection as to WHY it made for better theatre. This week, especially during the workout portions of the workshop, the “why” began to unfurl for me. In our workouts, if the objective was to lift our leg off of the ground, we would not simply fling it up into the air. We would push down on our navels so that our leg would naturally have no choice but to rise. This plays with the concept of voluntary and involuntary acting beats. Pushing down on my belly button was the voluntary action that involuntarily sent my leg up into the air. This same concept can be applied to scenes in theatre. Sure, it is interesting to watch an actor fall to the ground, but that is not theatre. In order for there to be a moment of theatre, there needs to be vulnerability in the actor. That vulnerability is expressed in the resistance the actor has to falling to the ground. The actor’s deep need to stay up and gravity’s extensive strength that denies this for the actor is what creates a moment of theatre. Theater that speaks to an audience on a deeper, more metaphorical level, engages the audience in a creative living ritual experience. It is here that we can communicate in the universal language of all humanity; a language that goes beyond culturally specific gesture to speak to the souls of the spectators and stimulate their imaginations. It is this interpretive “underbelly” that makes theater a living communal art form -- and not simply a literary one. The laws of physics are the fundamental building blocks of all communication, intrinsically connected to everything we do. The laws of physics are universal not idiosyncratic, tangible not esoteric. By giving weight, force, and time to emotions, an actor can embody the laws of physics. We can look at an object and assess if it is too heavy for us to lift, moving too fast for us to reach, or leaning too far for us to keep from falling. In the same way, we can assess people’s moods. Perhaps they seem too stuck in their ways to be open to a new idea, too vulnerable to hear bad news, or too far gone to receive any help. By learning to embody the laws of physics, the actor will develop a more sensitive instrument with which to communicate emotions and psychological states without having to gesticulate or indicate. By developing a hypersensitive instrument, we can track the growth of an emotion and control its path through a character’s body. By doing so, we will include the audience in a character’s emotional/psychological journey and actions will no longer be just gestures that indicate, but become poetic public manifestations of internal desires.